The placement of this term is quite interesting within the curriculum. It is places under "III Mathematics Pure". This leads me to believe that what is being taught here is perhaps more geared towards strategy, game theory, and probability. All of these forms of mathematics can be paralleled with war-like concepts. The use of the term Military is also quite interesting, as opposed to simply putting "strategy". A distinction is made between Military and Naval. Does this imply that Naval mathematics will be a different concept of math? Perhaps physics of water-based transportation? In 1818, America was experiencing significant landmark moments that developed an aura of patriotism. The White House was officially reopened, marking governmental growth and a place for all Americans to once again turn their eyes. The US flag is decided by Congress for 13 alternating red and white stripes and 20 white stars. Andrew Jackson, the General, was making historic strides towards taking land from those who had previously held the power in them. In the midsts of this great growth in America, it is quite plausible that the Commissioners felt their own pull towards making a mark on America's future. The patriotic-soldieresque diction employed in this brief excerpt, "discharge", notes the tone of the Commissioners as they developed this document. They had a tone of optimism, a hope for the future. Even though this document reveals major flaws in their vision, their optimism and energy is irrefutable. Virginia, from my understanding, highly agricultural during the time of this document. In a state full of plantations, where assumably fathers were the head of such organizations and highly separated from the functioning of his family, why is a father-son relationship an ideal? Teaching up until a fairly older range of childhood was completed by teachers or mothers. This passage underlines a belief being eventuated through the University's start-up that the most valuable content learned by a growing boy is that learned by his father. The stereotypical nurturing qualities of a mother-son relationship are not highlighted here. This passage also suggests theres an alternative setup of tutor-pupil that doesn't reflect that of a father-son relationship. Is this version the University's planners are attempting to shy away from the traditional relationship of teacher-students? If so, how does this play a role in the University's teaching methods when compared to other universities? This segment of the Rockfish Gap Report makes an interesting suggestion that there are populations in Virginia exist outside of the white population. In a time when African-Americans were, on a wide scale, wrongly considered subhuman, this passage suggests the founders, though highly discriminatory, recognize African-Americans as a population of humans that require distinguishing from. For me, an interesting series of questions emerged. Was this distinguishing of white-populations as opposed to African-American populations a marker of a changing society or simply a need for founders to continue elevating an already all-powerful white class? The Yukon Territory is a small, western Canadian territory with a rich history, including records dating back to 10,000 years go. In the Yukon Territory, there are a variety of languages spoken including Vunut Gwitchin, Han, Tutchone, Northern Tutchone, Southern Tutchone, Upper Tanana, Kaska, Tagish, and Tlingit (Pinnacle Travel). Another small ethnic group that is French-speaking remains from those who migrated from the Gold Rush. In the late 1700s, the Yukon became a major trading area between Tlingit and other Yukon people (Government of Yukon). In 1852, Tlingit traders pushed the Hudson Bay Company out of the Yukon in 1852. In 1886, a trading post was established at the Stewart River and coarse gold was found at the Fortymile River and the Yukon Gold Rush began. In 1898, the Yukon Territory Act was passed to consider the Yukon as separate from the North-West Territories, with Dawson City as its capital. In 1972, Elijah Smith and some of the Yukon First Nations tribe went to Ottawa seeking land claims. The final agreement, The Umbrella Agreement, was signed in 1993 and was signed by the governments of Canada and Yukon and the Council of Yukon First Nations. The Yukon First Nations’ final land claim was complete in 1995. In 2003, the Devolution Transfer Agreement was passed, allowing the Yukon government more control over provincial programming and powers. References: "Government of Yukon." History - Government of Yukon- Government of Yukon. January 5, 2015. Accessed May 07, 2017. http://www.gov.yk.ca/aboutyukon/history.html. "Pinnacle Marketing Management Inc." Pinnacle Travel. Accessed May 07, 2017. https://www.pinnacle-travel.org/yukon-culture-history/. 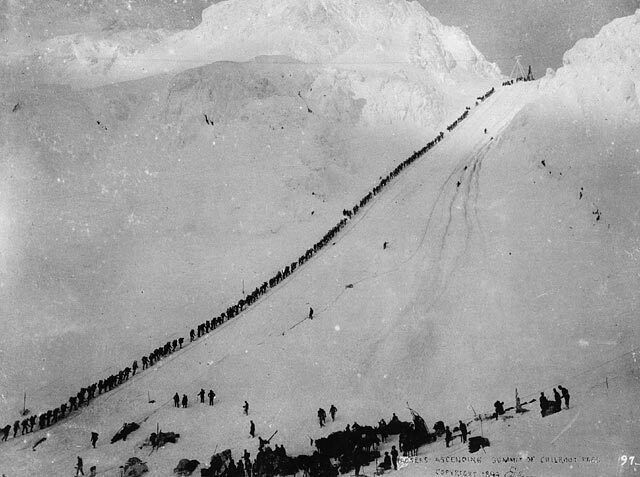 The Klondike gold rush is characterized by the vast movement of white prospectors through the Mackenzie Valley in pursuit of Yukon gold fields. This mass of white prospectors were primarily American. Prospectors primarily entered the valley through the Chilkoot Pass, which was a lower area of mountains that allowed prospectors to haul equipment into the valley. This movement elicited issues of land and border disputes that involved indigenous peoples and the United States and Canadian governments. Indigenous people lived on lands that were being entered by prospectors and the Canadian government wished to keep the northern territories peaceful for the use of extracting the valuable resource of gold. So, with the signing of Treaty 8 by Queen Victoria, First Nations from the Lesser Slave Lake area were displaced to an area roughly 840,000 square kilometers. With these actions of the Klondike Gold Rush and the signing of Treaty 8, “Americans and Britons successfully sought gold, displaced native groups, and lived together peaceably” (Arenson, 375-376). The second major issue that arose during the 1898 Klondike Gold Rush was the dispute between Canadian and American lands. The disagreement occurred along the Alaskan Panhandle where the small towns of Dyea and Skagway were located. These vital port towns allowed access into the Yukon Territory (Petrakos, 366). The port towns were so valuable because they allowed people and supplies to pour into and out of the Yukon Territory. This being said, they were highly profitable, which increased tensions on the dispute over these towns. Canada feared that their land claims on the panhandle would be disregarded as the large migration of Americans to the panhandle area began to overrun the existing Canadian population present on the panhandle. This fear of disputed land spread into the Yukon gold fields as an excessive amount of Americans began to seek their Manifest Destiny. With this anxiety of American migration to the Klondike, the Canadian Government began to advocate for the movement of Canadian miners and the creation of Canadian infrastructure in the Yukon gold fields. This action came in hopes to increase the Canadian presence in the region and to bolster Canadians position in the Yukon Territory. Arenson, Adam. 2007. "Anglo-Saxonism in the Yukon: The Klondike Nugget and American-British Relations in the “Two Wests”; 1898-1901." Pacific Historical Review 76 (3): 373-404. Petrakos, Christopher. 2016. "William Ogilvie, the Klondike Borderlands and the Making of the Canadian West." The American Review of Canadian Studies 46 (3): 362-379. Wharton, David. 1972. The Alaska Gold Rush. Bloomington: Indiana University Press. The largest source of gold supply, at approximately 2500 tonnes, came from mine production. From Mexico, Spain expanded northward. Lured by the promises of gold and another Tenochtitlán, Spanish expeditions scoured North America for another wealthy Indian empire. It's always interesting to see that the pattern in history was always to chase riches and are fueled by promises of resource, whether it be consumable resources or precious metals.